Pak Lebai was a wishy-washy man. He always changes his mind before he did something. He lived in a village next to a river. Every day, he always used his sampan for travelling on the river. One day, Pak Lebai was paddling his sampan at the river. Suddenly, he heard someone called out his name. It was his neighbor. "Pak Lebai, can you come to my house tomorrow? I will have a party", said the neighbor. Pak Lebai was happy. He loved party because he could eat delicious food. He also could get a buffalo's head from the party. Still on the same day, he got another invitation. Those two party invitations made him confused. The two parties were held at the same time, but at the different places. The two neighbors who invited him lived on different sides of the river. One neighbor lived on the east side and another one lived on the west side. "I will go to the east side. I can have two heads of buffalo. He is richer," said Pak Lebai. On the following day, he paddled his sampan with great power to the east side. He did not want to be late and lost the buffalo's head. On the way to the party, he met some friends. "The party is awful. There are not many buffalo's heads. He is very stingy, "said one of them. "I don't care. I'm still going there. He is my friend. 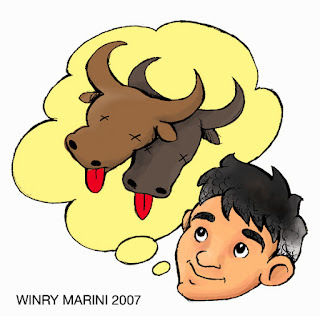 I'm sure he will give me the buffalo's head," said Pak Lebai. He immediately paddled his sampan. Right before he arrived at the east side of the river, he changed his mind. He knew the host was stingy. He thought that he would not get a buffalo's head. So he turned back his sampan and went to the west side. Again, he paddled his sampan with great power. He did not have much time. Unfortunately, right before he arrived at the west side he met his friends again. "What are you doing here, Pak Lebai? The party is over." Pak Lebai was upset and blaming himself for being wishy-washy. He also tired because he was paddling back and forth in the river. Later he fell asleep in his sampan. He did not realize his sampan was drifting away in the river. When he woke up, he was already in the different village.